Feel free to debate the topic in the comments section, or submit a list of your own! 10. Bob Berry – Berry was probably better known for his Super Bowl outings with the Vikings, playing in Super Bowls VIII, IX and XI. He was the Falcons starter five seasons, from 1968 to 1972. He started in 51 games, throwing for 8,489 yards and 57 touchdowns, with a passer rating of 79.2. He was selected to the Pro Bowl in 1969. Never a flashy thrower, Berry was consistent and a solid QB for the time he played in. 9. David Archer – Though he only started 23 games for the Falcons between 1984 and 1987, Archer had some memorable moments, and he ranks ninth in team history with 4275 passing yards. In 1986, Archer threw for a career high 2007 yards with 10 TD passes (also career high) and 9 interceptions. Best known as the current color radio guy for the Falcons. 8. Randy Johnson – No, not the pitcher, this was a QB that was the Falcons QB who was the starting quarterback for the Falcons in their inaugural season of 1966. He quarterbacked the Falcons from 1966 to 1970 and ranks eighth in franchise history with 5538 passing yards. Johnson’s best season in Atlanta was 1966, when, despite 21 picks, he threw for career best numbers in yards (1795) and touchdowns (12). 7. Jeff George – A loud, brash QB that was supposed to thrive in the run and shoot, George did have some big numbers, but never truly lived up to the hype. He played three seasons for the Falcons, 1994-96, and still is 5th in yards throwing with 8575 yards. George had one of his best seasons in Atlanta in 1995, when he threw for a career high 4143 yards with 24 touchdowns and 11 picks. He could have been a star for a long time if he would have kept his mouth shut. 6. Bobby Hebert – Probably still better known for his years with the Saints, Hebert came to the Falcons and had a couple solid seasons in 1993 and 1996. His best season with the Falcons was 1993, when he went to the Pro Bowl with 2978 yards with 24 TD passes (career high) and 17 interceptions. 5. Chris Miller – Miller played in 10 NFL seasons from 1987–1995 and 1999. His best year as a pro came during the 1991 season for the Falcons when he threw for over 3000 yards and 26 touchdowns. He has a losing overall record as a starter with the Falcons (23-43), but ranks second in team history with 14,066 passing yards. 4. Chris Chandler – He will be remembered for being the QB that helped the Falcons make it to their only Super Bowl, losing to the Broncos in the 1998 season. He put up a 13-1 record as a starter in 1998, and overall played for the Falcons from 1997 to 2001 and ranks third in franchise history with 13,268 passing yards as well. !998 was Chandler’s best season, as he threw for career highs in yards (3154) and touchdowns (25) with 12 interceptions. 2. Matt Ryan – Matty “Ice” as he’s better known, as jumped up the charts as the second best QB in team history after just four seasons. He’s started all but two games in those four seasons, and led the Falcons to the playoffs with an 11-5 season record. He has also earned honors as the 2008 NFL AP Offensive Rookie of the Year. In four years Ryan has thrown for 95 TD’s and 46 picks, and 14,238 yards. He’s well on pace to being the best QB in team history, but a few playoff wins would be nice. 1. Steve Bartkowski – He played for the Falcons from 1975 to 1985 and while his record wasn’t the best (55-66), he threw for a lot of yards and was as good as they come for those years with the Falcons. 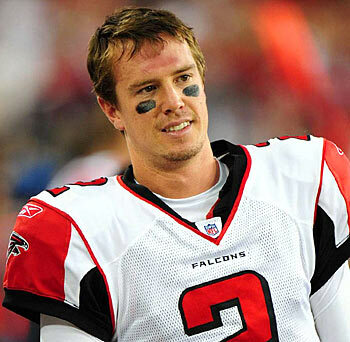 He ranks first in Falcons’ history with 23,470 passing yards. Bartkowski went to the Pro Bowl in both 1980 and 1981. In 1980, he had a career best 3829 passing yards, but 1981 was a better overall season-3544 yards with career high 31 touchdown passes and 16 interceptions. You nailed the top four but Berry contributed more than your numbers 5-9.
give your page higher rank & authority in google.